Since the 1980s, arguments for a multicultural Japan have gained considerable currency against an entrenched myth of national homogeneity. Working Skin enters this conversation with an ethnography of Japan’s “Buraku” people. Touted as Japan’s largest minority, the Buraku are stigmatized because of associations with labor considered unclean, such as leather and meat production. That labor, however, is vanishing from Japan: Liberalized markets have sent these jobs overseas, and changes in family and residential record-keeping have made it harder to track connections to these industries. Multiculturalism, as a project of managing difference, comes into ascendancy and relief just as the labor it struggles to represent is disappearing. 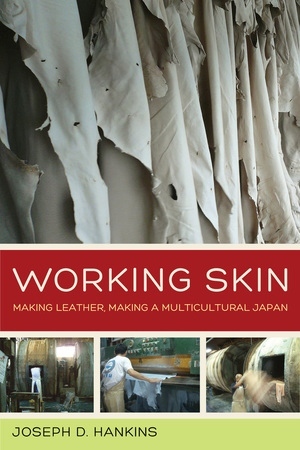 Working Skin develops this argument by exploring the interconnected work of tanners in Japan, Buraku rights activists and their South Asian allies, as well as cattle ranchers in West Texas, United Nations officials, and international NGO advocates. Moving deftly across these engagements, Joseph Hankins analyzes the global political and economic demands of the labor of multiculturalism. Written in accessible prose, this book speaks to larger theoretical debates in critical anthropology, Asian and cultural studies, and examinations of liberalism and empire, and it will appeal to audiences interested in social movements, stigmatization, and the overlapping circulation of language, politics, and capital. Joseph D. Hankins researches the politics and productivity of labor. He is Assistant Professor of Anthropology at UC San Diego and is affiliated with the UCSD Critical Gender Studies Program and the UC Center for New Racial Studies. He was raised in Lubbock, Texas, one source of the rawhide processed in Japanese tanneries. "A fascinating mediation that weaves between the making of leather and the making of a multicultural Japan. Masculinized forms of industrialized tanning intersect with the feminized work of website design and solidarity tourism in efforts to turn 'Discrimination Based on Work and Descent' into imaginations of a world free from racism and built on global solidarity and 'complete liberation.'" "A product of ingenuity, scrupulous considerations, and ethical commitment, Working Skin suggests, through the analytics of critical multiculturalism and labor, new possibilities of transnational Japanese ethnography as part of the ongoing project of politicizing anthropology for the modern world."